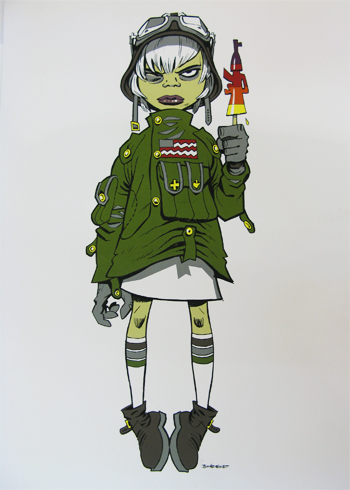 English artist Jamie Hewlett (1968) is best known for co-creating comic strip Tank Girl and the band Gorillaz. While studying at Northbrook College, Hewlett and Alan Martin created a fanzine called Atomtan which gained the attention of Brett Erwin. Erwin helped Hewlett and Martin expand one of their characters – Tank Girl into a comic strip for the comic magazine ‘Deadline.’ Anarchic, Tank Girl became the most popular strip in the magazine and earned a great deal of media attention. The teenage punk character became a style icon in the UK and the comic strip was later made into a Hollywood Motion Picture. Hewlett went on to becoming a major cartoon creator working on strips for Sci-Fi comic 2000 AD most notably with writer Peter Milligan on Hewliggan’s Haircut. 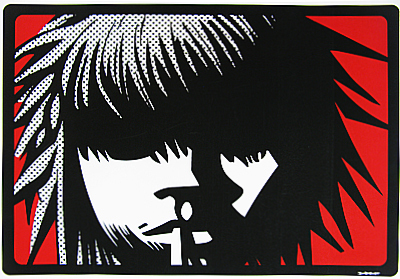 In 2001, Jamie Hewlett and Damon Albarn released the first album of the virtual anti-band Gorillaz. Albarn produces the music while Hewlett designs the characters of the band. Both Gorillaz and their second album Demon Days was a huge success and earned Hewlett the Design Museum’s Designer of the Year award in 2006. 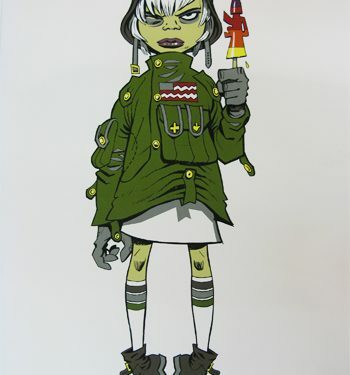 Hewlett’s style has a quirky edge that has made him a forerunner of post-punk British pop culture.